Lisa Harvey is a popular girl at school, and Jackie and Janis are her best friends. Life is not perfect for Lisa, though. At home, Lisa’s mother is not devoting the attention to Lisa that she ought because she’s too wrapped up with her career in beauty consultation. At school, Lisa has an enemy in Rosie Belcher, “The Incredible Bulk”. Rosie is jealous that Lisa is popular while she is not. Rosie never thinks that she never does anything to make herself popular. She is a bully and is not kind or polite to anyone. Worse, she has very disgusting eating habits and manners that she likes to nauseate the girls with. We learn later the whole Belcher household is this way; Rosie’s brother Mervyn is apparently even worse than she is, and his nickname is “Gobber”. Rosie blames everyone but herself for being so unpopular: “It’s victimisation. They always pick on me.” Rosie does not appreciate that Lisa is kinder to her than the other girls: “Rosie lives next door and I feel a bit sorry for her.” They tell Lisa she is too nice for her own good and she would be wiser to avoid Rosie. But Lisa’s problems really start when a strange woman starts following her around. Eventually Lisa decides enough is enough and confronts the woman, who says she will be in touch with her soon. In the wake of the woman’s appearance, Lisa starts experiencing strange bouts where she acts like a four-year-old girl, and then returns to normal. At school, Lisa’s odd bouts of acting like a four-year-old are worsening. Rosie intends to take advantage of it to get her revenge on Lisa. And as Rosie lives next door to Lisa and Lisa foolishly lets her get closer to her than the others do, this will make whatever Rosie plans easier to carry out. The woman still follows Lisa around. Lisa snaps and tells her to clear off or she’ll call the police. The woman says she is “sure now” and has Lisa tell her parents she will call tomorrow evening. Scared, Lisa turns to Janis and Jackie for support as her mother won’t listen. At the fun fair, Lisa raises Rosie’s temper, so she runs into the crazy house to get away from her. In the crazy house, Lisa is chased by a terrifying man who threatens to punish her for not taking her medicine. When the man corners Rosie, she reverts to her strange childish behaviour and screams, “Mummy-mummy-mummy, let me out!” When she comes out of the crazy house, there is no sign of the horrible man. The strange woman takes the shaken Lisa off for a soothing cuppa. The woman introduces herself as Mrs Prendergast, and she once had a beautiful daughter named Rachel. Rachel had a teddy bear just like the one Lisa has just won at the fair, which we suspect helped to trigger Lisa’s fit. She shows Lisa a photo of Rachel, which shows she is the girl from Lisa’s nightmare, but reveals little else. Mrs Harvey doesn’t take what Lisa says about Mrs Prendergast seriously and thinks Mrs Prendergast is interested in her beauty products. But the Harvey parents get a shock when Mrs Prendergast tells her story. She lost her beloved Rachel at the age of four. Mrs Prendergast could still feel Rachel’s presence for some reason, and at her doctor’s advice went abroad, but she has never really come to terms with her grief. Mrs Prendergast stumbled across reincarnation, and in particular how a child who dies in tragic circumstances, before their time, can remember their previous incarnation if they come back too soon. When she returned to Britain, Mrs Prendergast saw a ghost of Rachel, which disappeared inside Lisa’s body. Realising how much Lisa reminds her of Rachel, Mrs Prendergast did some investigating and discovered Lisa was born at the same time Rachel died, and in the same hospital. So Mrs Prendergast believes Lisa is the reincarnation of Rachel, and for this reason she wants to visit Lisa regularly. The Harvey family are naturally shocked and angry and tell Mrs Prendergast to go away. Lisa also notices a curious omission in Mrs Prendergast’s story – she did not explain how Rachel died. The parents want to forget the whole thing, and don’t take Lisa’s claims of strange nightmares seriously, but Jackie and Janis listen to Lisa more. Lisa’s odd behaviour of reverting to four-year-old behaviour gets worse at school. Realising that this behaviour is triggered when Lisa is called “Rachel” (but Lisa returns to normal if she is called “Lisa”), Rosie begins to take advantage to ‘befriend’ Lisa when she is in Rachel mode and get her into trouble. She starts by having ‘Rachel’ scrawl pictures all over the classroom walls, and is very annoyed when the teacher decides leniency is the best approach. Suspicious, Jackie and Janis check Rosie’s desk and find the markers Rosie helped ‘Rachel’ with. They warn Lisa that she must well and truly watch out for Rosie now. Lisa finds Mrs Prendergast is still hanging around. She follows Mrs Prendergast to Rachel’s grave. When Lisa finds she was indeed born on the same day Rachel died, she accepts what Mrs Prendergast says as true and begs Rachel to set her free. Mrs Prendergast overhears, and evades the question of how Rachel died when Lisa asks her directly. Instead, Mrs Prendergast repeats her desire to get close to Lisa, and even tries to bribe her into it. Lisa tells her to go away and runs off. Meanwhile, Jackie and Janis try to tell Mrs Harvey about Lisa’s strange behaviour at school, but she just dismisses it. Rosie visits Lisa’s house and makes her act like Rachel, which enables her to steal money that Lisa was saving for a new skirt for the disco. After Rosie leaves, Jackie and Janis find Lisa still in Rachel mode, and are shocked when Lisa’s reflection changes to Rachel in a mirror. They plead with Rachel to leave Lisa alone. Rachel replies she is lost and does not know where to go. They tell her to go home, at which Rachel shows them an image of her house. This is followed by images of Rachel crying in her bedroom, and then banging on her bedroom window while screaming “Mummy-mummy-mummy-let-me-out!” Then the mirror explodes. Jackie and Janis decide to track down the house. Meanwhile, Lisa enrages Rosie further by getting the money she pinched back off her and buys the skirt. While Lisa enjoys herself at the disco, Jackie and Janis head off to check the house. But while they do so, Rosie bullies her way in (by stealing another girl’s ticket) and gets Lisa to act like Rachel so she can use it to humiliate her in public. Rosie gets ‘Rachel’ to put on makeup in a manner that will make her look like a clown. Rosie thinks that the girls will get such a laugh out of the joke that she will become popular at last. While they are all out, Mrs Prendergast phones Mrs Harvey to say Lisa is in danger because Rachel was reincarnated too soon, which means an early death. Mrs Harvey won’t listen because she is afraid of losing Lisa, which is the reason she’s been burying her head in the sand about the whole matter. She feels she has to carry on as if everything is normal, so she returns to her lingerie party, and hope the trouble will all go away. Jackie and Janis find Rachel’s house burned out and abandoned, which is the first clue as to how she died. They also encounter a nasty man trimming the hedge, who calls them ghouls who wallow in other people’s misery and tells them to go away. Following this, they decide to investigate the house after dark. Then Janis’s Uncle Bill comes along, and he is able to tell them what happened. Rachel’s father had a terrible temper and always made her suffer for it. One day he locked Rachel in her room, at the top of the house, as a punishment. But a fire broke out, the cause of which was never determined. Rachel was unable to escape because the door was locked and the window had been made childproof. This was how Rachel came to be banging on the window and screaming as she did. Mr Prendergast was too far away trimming the hedge to hear Rachel’s cries for help. By the time he did, it was too late. The fire claimed him as well when he tried to rescue Rachel, possibly because he felt too guilty to try to escape. When the girls ask for a description of Mr Prendergast, they find it matches the description of the man they saw – so his ghost has come back as well? After this, Janis and Jackie are too scared to enter the house after dark and head back to the disco. They arrive back at the disco just in time to see how Rosie is humiliating ‘Rachel’, and get her back to normal mode. Rosie is banned from the hall for this and for her bullying of the other girl. Lisa heads for home, but Rachel’s power draws her to the Prendergast house, where Mrs Prendergast says it is time for them to be together. Mr Prendergast’s ghost tries to warn Lisa off, but she recognises him as the horrible man who chased her in the crazy house and does not listen. She heads for Rachel’s bedroom, where Mrs Prendergast is waiting. Lisa starts the banging behaviour on the window and screaming for Mummy to let her out. Mummy now does so by opening the window. She then directs Lisa out the window, where they will both be free and the mistake of Rachel coming back too soon will finally be rectified. Meanwhile, Jackie and Janis have called at Lisa’s house to check on her, and found her not there. Mrs Harvey tells them what Mrs Prendergast said and now regrets not having the situation seriously instead of trying to deny it. They head out to the Prendergast house, where they are horrified to see Mrs Prendergast and Lisa on the window ledge. When they call “No, Lisa! No!”, Lisa snaps out of Rachel mode. Once Lisa realises where she is, she tries to fight Mrs Prendergast. The struggle results in Mrs Prendergast falling to her death. Lisa realises the return of Mrs Prendergast was what stirred up the ghosts and memories of her Prendergast incarnation. So now that Mrs Prendergast is gone, they cease to plague Lisa. Misty drew on much of the popular horror, fantasy and SF films and literature of her day. Hush, Hush Sweet Rachel is Misty’s version of Audrey Rose. Audrey Rose Hoover dies in a burning car while banging and screaming against the window. She is reincarnated as Ivy Templeton, but the reincarnation came too soon. This meant there was an insufficient in-between resolution period for Audrey Rose’s soul and its karma in the astral planes, and this is having adverse effects on the current incarnation. Audrey Rose’s father Elliot starts interfering in the lives of Ivy’s family because he figured out the reincarnation and wants to get close to his daughter again through her reincarnation. This triggers nightmares in Ivy in which she keeps reliving the death throes of Audrey Rose screaming and banging against the car window while the fire rages. The only one who can handle Ivy’s fits is Elliot, but this eventually lands him in court on charges of kidnapping Ivy, with the existence of reincarnation on trial. Unlike Audrey Rose, which is taken from the adults’ perspective rather than Ivy’s, Sweet Rachel is taken from the schoolgirl perspective of the protagonist and her two best friends. The parents are what they so often are in girls’ comics – completely useless because either they don’t listen or they don’t treat it with the seriousness it requires until near the end. Sometimes they don’t even wake up to it at all, as in Mandy’s Bad Luck Barbara. At least we get more insights into the psychology of it all than we usually do. At first Mrs Harvey comes across as a neglectful, thoughtless mother, but gradually we learn that she does genuinely love Lisa. Her cavalier attitude was motivated by fear and trying to evade the situation instead of facing it. Unfortunately, this led to her constantly failing Lisa until near the end. As for Mr Harvey, we hardly see anything of him except for the meeting with Mrs Prendergast, where he tells her to leave them alone. Lisa’s nightmares of Rachel’s death throes parallel those that Ivy experiences. But, considering that visions and apparitions of Rachel do appear in the story, it’s hard to say whether Lisa’s odd behaviour stems from her just being a reincarnation of Rachel or if Rachel came back as a ghost and is possessing Lisa. When the ghost of Mr Prendergast is introduced, it becomes clear that the ghost theme is as strong as the reincarnation theme, and they overlap so much that it is hard to tell just what is going on with Lisa. Is it a disturbed reincarnation or a ghostly possession, or is it a blend of the two? Also unlike Audrey Rose, Sweet Rachel goes along the path of a mystery story (which girl readers just loved) that needs to be unravelled. This stems from Mrs Prendergast not telling the whole story. For some reason she won’t say how Rachel died, and this is clearly linked with the strange nightmares Lisa is having. Mrs Prendergast has seen for them for herself, but unlike Elliot Hoover she does not explain what the nightmares are about or help to stop the nightmares when they occur. As the story is told from the girls’ perspective, the school environment, school bullying and the teen scene take the stage rather than the theology of reincarnation, which gets so heavy in Audrey Rose. Rosie Belcher comes from a long line of jealous, unpopular girls who want to bring down the protagonist because she’s so popular, and set out to do it by playing upon the problem the protagonist develops in the story. In this case, Rosie is taking advantage of Lisa’s ‘Rachel’ behaviour to humiliate her, get her into trouble, and destroy everything she hates in Lisa. But every step of the way she fails, and her nasty tricks only serve to make her even more unpopular. Not that she sees it that way. Rosie just cannot understand that it is her own conduct that makes her so unpopular. Just what the inspiration was for Rosie’s repulsive eating habits is harder to understand though. Perhaps it was based on a real person Pat Mills knew at school or real-life neighbours who were just like the Belcher family. Or, as this is Misty, did the Misty team decide to go for the gross-out with Rosie to make her a more interesting character? Or are the Belchers reincarnated pigs or something? Rosie brings something to the story that Audrey Rose did not have – a villain. There are no villains in Audrey Rose, so Sweet Rachel definitely has more edge and menace there. Unlike Elliot Hoover, Mrs Prendergast can also be regarded as a villain. For one thing, she is clearly not giving the whole story. Hoover was upfront on how Audrey Rose died straight from the start, but Mrs Prendergast is evasive on how Rachel died, which makes her a more suspicious and ominous character. Moreover, while Hoover genuinely wants to help Ivy/Audrey work through an unsettled reincarnation, Mrs Prendergast is clearly trying to get Lisa/Rachel out of possessiveness, even if it means killing them both on the window ledge. For these reasons, Mrs Prendergast does not come across as a particularly sympathetic character, although her tragic story does make us feel sorry for her in many ways. She is a character who gives both Lisa and us the creeps, especially when we read her remarks that she and Rachel are soon going to be together. We don’t trust her at all. And it is very odd for Mrs Prendergast to warn Mrs Harvey that the hasty reincarnation could mean an early death for Lisa (now why would that be so?) and she could be in danger when it turns out Mrs Prendergast herself is the danger to Lisa/Rachel. When we learn more about Rachel’s home life, we have to decide which Prendergast parent is more deserving of our sympathy. The dangers Mrs Prendergast posed to Lisa/Rachel have already been described. On the other hand, Mrs Prendergast was clearly the kind, caring parent who gave Rachel the love that she needed against a father who was borderline abusive. In fact, Mr Prendergast even looks like an ogre with a tall, burly build, a squint, and even red eyes! We have to wonder why Mrs Prendergast married him in the first place. Yet Mr Prendergast has more redeeming qualities than his wife. Although he is set up as a villain with his appearance and terrifying, aggressive conduct, it turns out he is not the true villain after all. Moreover, guilt over the tragedy redeemed him and his harsh parenting, and he tried to save Rachel twice. On the second round he is more successful, even if it is just because Lisa’s mother and friends arrived in the nick of time. 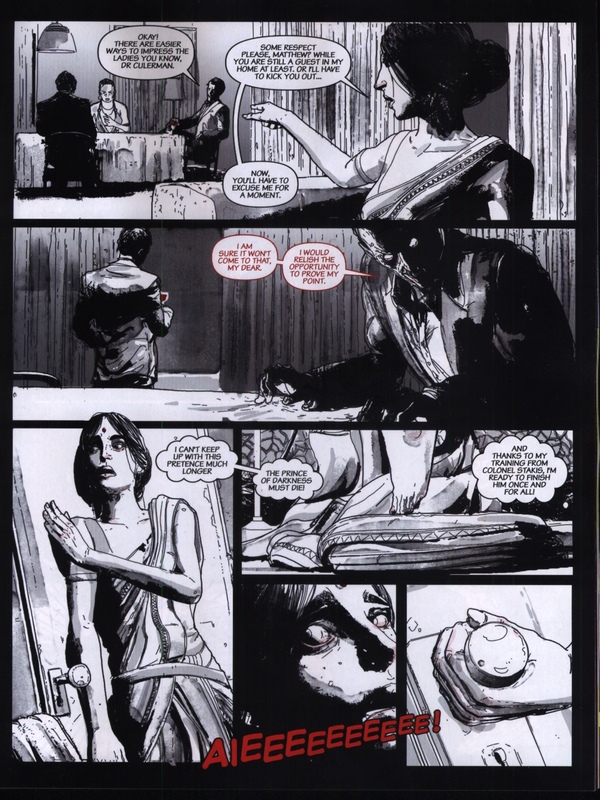 Eduardo Feito’s artwork really adds to the creepy atmosphere of the story, particularly in its use of tippling, etching, light brushwork, and shadowing, and even adding a dash of feral to it. The innocence in the expressions on Lisa’s face has a soft childlike quality, which blends in with the concept of possession by a four-year-old. All Rosemary Black wants is to lead a normal life and have friends, but she does not get much chance at home or at school. Her mother (no father is present) is severe and abusive, and she shows Rosemary no love or affection at all. She is always beating Rosemary black and blue with a cane because she thinks there is a “dark wickedness” in Rosemary that must be beaten out. What dark wickedness? Rosemary is clearly not a bad lot. At one point Mrs Black is hauled up before the magistrate because of her treatment of Rosemary. But the magistrate dismisses the case without even a slap on the wrist. He believes parents should use more discipline, and just tells Mrs Black not to overdo it in future. Mrs Black is not only abusive but strange as well. She does not allow gas or electricity at her house (Rosemary has to do her homework by candlelight). She does not allow Rosemary any freedom or dress fashionably like other girls, and she clamps down on any bids for these with more abuse, and bigotry to rival any fundamentalist. She doesn’t even allow Rosemary to have birthday parties (something that will have dire consequences later). Strangest of all, Mrs Black sometimes looks at Rosemary as if she’s afraid of her – now what could be the reason for that? Mrs Black’s dress sense is just as bizarre; she always goes out wearing a black cloak. This makes her look like a witch, which is precisely what everyone whispers whenever they see her. Yes, Mrs Black has clearly got quite a reputation around the town for weirdness if not witchiness. It seems Rosemary does too; there is graffiti on a wall that says: “Rosemary Black is a weirdo”. It looks like someone else wrote “true” underneath that. We get a pretty good idea on who wrote that graffiti when we get to Rosemary’s school. Girls pick on Rosemary because there’s something strange about her that nobody can really pinpoint. The worst bully is Norma Sykes, who’s a bad lot and got ‘delinquent’ written all over her (and where does she get those fags of hers when she must be underage, like Rosemary?). Her reason (or excuse) for tormenting Rosemary is that in her view Rosemary deserves it for being so weird, and her daily fix is getting Rosemary to cry. Norma has two cronies, Freda and Dawn, and she constantly holds them to their oath of loyalty to her. Anne is Rosemary’s only friend at school. Anne gives Rosemary a more fashionable hairdo, which exposes a crescent moon-shaped mark on her forehead. After Rosemary finds the moon mark, strange things do begin to happen to her in earnest. It’s like there’s some sort of power growing inside her; small objects move and a television set goes on the blink for no apparent reason when Rosemary is around. The power gets stronger when the moon is full, and the school nurse finds the mark is burning red hot although Rosemary has no temperature. But the first really spectacular event occurs when one of Norma’s tricks (match in a piece of chalk) sets Rosemary’s hair on fire. Rosemary seems to subconsciously lash out at Norma – and then a bookcase starts toppling towards the bully. Norma narrowly avoids being flattened. Rosemary is sent to the school nurse, who refers her to the school doctor, Dr Armstrong, about the moon mark. Afterwards, Rosemary and Anne discuss this strange power that seems to be growing. It grows even more when it enables Rosemary to save Anne from a nasty accident and they realise strong emotion is key. That night, a full moon prompts Rosemary to practise with the power, and she gains more control over it. When Mrs Black sees what Rosemary is doing, she really goes berserk. She yells that she knew it would happen and it was the evil she had been trying to beat out of Rosemary all along. She really brings the cane on this time to teach Rosemary not to use her “wicked gift”. However, Rosemary snatches the cane away with her powers: “No! You will not hit me…ever again!” And wouldn’t you know it – Mrs Black never beats Rosemary again! Meanwhile, Norma wants revenge on Rosemary because of the punishment she got for the match trick (although her cronies did the lines for her) and brings out her big guns. Norma’s plan, called “Operation Rosemary”, is intended to hurt Rosemary where it hurts most by crushing the thing that Rosemary desires the most. In order to find out what this desire is, Norma directs Dawn to become ‘friendly’ with Rosemary. Anne is to be pushed out of the way in order to help this along. Dawn is to gain enough of Rosemary’s trust for her to say what the desire is. Then they will concoct the way to ruin it. Next day, Rosemary is surprised at Dawn suddenly coming all over friendly and helpful to her. Even Norma is leaving her alone. Rosemary wonders if the other girls are starting to accept her. Anne is suspicious at this sudden friendliness from Dawn and warns Rosemary to be the same. Anne’s suspicions make things too difficult for Dawn to break them up. Norma decides hard measures are required to get rid of Anne, so she fouls Anne at a hockey match to put her in hospital. Meanwhile, Dr Armstrong is intrigued at Rosemary’s moon mark. He becomes even more intrigued when the needle bends inexplicably when he tries to give Rosemary an injection. He wants to refer her for further testing. For this he gives Rosemary a consent form for her mother to sign. Mrs Black throws the form away, saying the gift is evil and she does not want that sort of interference. That night Rosemary has a strange nightmare of a raging fire where Norma, Freda, Dawn, and even Anne are laughing hysterically at her. Then she falls into the fire. Upon awakening, Rosemary checks on her mother, and is surprised to find a photograph of a beautiful woman who also has the moon mark. Mrs Black explains that it is Rosemary’s grandmother. Grandmother also had the “evil” gift and something terrible happened to her because of it. Mrs Black tells Rosemary not to use that gift or something similar will happen to her. Rosemary can’t really believe it because Grandmother looks a nice woman to her and she is soon feeling a bond with her. Mrs Black goes crazy and tries to burn the photograph, but Rosemary rescues the photograph with her powers. At this, Mrs Black washes her hands of Rosemary entirely, though just what she means by that is not clear. To help decide things, Rosemary retrieves the consent form and forges her mother’s signature on it so she can have the tests. Dr Armstrong watches Rosemary’s powers in action at the tests. This includes her powers going berserk and smashing up the laboratory when she gets distressed at the sight of Anne being carried away on a stretcher. Dr Armstrong tells her that her power is called telekinesis. Rosemary tells him about her grandmother having the power and the mother’s attitude about it. So Dr Armstrong now wants to interview Mrs Black. Unbeknownst to Rosemary, Dr Armstrong is getting greedy and wants to use his discovery to catapult him to the heights of fame in science. Dawn finally convinces Anne and Rosemary of her friendliness with a get-well present (flowers raided from the park flowerbed) in hospital. However, Dawn is still having problems obtaining the information Norma wants. And Rosemary is also getting the impression that they are being shadowed. At Dawn’s house, Rosemary uses her powers to distract Dawn’s kid brother from a tantrum by moving his toys telekinetically. He is thrilled with these fascinating antics with his toys. Then Rosemary is very surprised when another power, which is even stronger than hers, takes control of one of the toys and throws a scare into Dawn. Now where could that power have come from? Well, there is one other person with the power who’s been mentioned in the story…could that be a clue? Mrs Black is called up to the school. She tells the doctor and the nurse that the power and accompanying moon mark had run in the family for generations. Apparently she is the black sheep in reverse because she is the only one in the family without it. She says she was lucky in escaping the “curse” (pull the other one, as we see later!). As a child, Julia (Mrs Black’s first name) did not really mind her mother’s power and just thought it was strange. Then one night the power caused a terrible tragedy in the family. Grandmother was surprised by an intruder in the house, panicked, and used her telekinesis to hit him with an iron, which unwittingly caused his death. Too late she discovered that it was her own husband, who had gone AWOL from the army and was sneaking back to see them. Julia saw how her mother’s telekinesis had unwittingly killed her own father. From that moment on, Julia went against her mother, who was imprisoned because the police did not accept it was an accident (probably because they did not believe how it happened). Mrs Black had not seen her mother since then (she was raised in child welfare after that) and believes she died in prison. She blames the power for her father’s death, and calls both it and her mother evil. When she had Rosemary, she was horrified to discover her baby had the power too. Her harshness (which she begins to regret a bit) was meant to crush it and stop another terrible thing happening. The doctor and nurse try to reason with Mrs Black, saying the tragedy was not really her grandmother’s fault. The power itself is not evil; such thinking does not belong in this day and age. She does not listen and tells the doctor she will not have any more of his tests on Rosemary. Rosemary’s 13th birthday is coming up. This finally prompts her to tell Dawn what she would really like – a birthday party, which is something her strict mother has never allowed. So now the next phase of Operation Rosemary is planned. Norma says she will be Rosemary’s fairy godmother (a very evil fairy, of course) and give Rosemary “a very special birthday party” where they “give her da woiks!” Soon after, Dawn tells Rosemary they are organising a birthday party for her, and her house will be used for it. Dawn has arranged for her parents and kid brother to be absent from the house (to get them out of the way, of course). Mrs Black now tells Rosemary the story about the grandmother and just what she means when she says something terrible will happen if she keeps using the power. Rosemary gives in and promises not to use the power. But that night, Rosemary is surprised when that other power returns, and it is trying to enter the house. Being stronger than Rosemary’s, it wins the fight. The door opens to reveal…Grandmother (died in prison, huh?). Grandmother says she has been watching Dawn, figured out her game (that toy terror was an attempt to scare Dawn off) and come to warn Rosemary. Mrs Black finds Grandmother in the house and is not making her welcome. Grandmother rebukes Mrs Black for the way she treated Rosemary. When Rosemary says it was meant for her own good, Grandmother says that’s not the real reason. The truth is that Mrs Black is jealous because she was the only one in the family without the power, and she took it out on Rosemary. One look at Mrs Black’s face confirms this, as do her comments that if she had inherited the power she would have used it for evil: “Oh, what I could have done with the power!” Rosemary goes upstairs all confused and just wanting to be ordinary. After Grandmother’s visit, the relationship between Rosemary and her mother becomes so bad that they are hardly speaking to each other. Unfortunately, Rosemary does not heed Grandmother’s warning about Dawn. In her view she can trust Dawn because Anne does now (haven’t you heard of misplaced trust, Rosemary?). So the party/final stage of Operation Rosemary goes ahead at Dawn’s house. At the party, Norma and her gang lock Anne up so she cannot interfere with Operation Rosemary. It is a birthday party where everything is designed to be horrible and reduce Rosemary to tears. The birthday ‘surprises’ include presents filled with nasty things such as worms, and a birthday cake laden with the most vile ingredients Norma could find: fag butts, cat meat, fish bones, rotten eggs and the like. The bullies ruin Rosemary’s newly made party dress by spraying all over it, and all over her as well. Upstairs they bully Rosemary further with ‘party games’. But they didn’t mean the balustrade to break and Rosemary fall off the staircase. Then the bullies are really surprised to see Rosemary floating in mid air! (We learn later that Grandmother was holding her telekinetically.) Rosemary says it’s her turn now, so Operation Rosemary now meets Rosemary’s revenge as Rosemary’s real party begins. Rosemary starts using her telekinesis to attack the bullies. One of the best moments is where she telekinetically throws the vile ‘birthday cake’ right into Norma’s face. Talk about a taste of your own medicine! As she goes, Rosemary shouts that she is now figuring out their whole plan, and she also finds and releases Anne. The bullies are terrified, terrorised and trying to run. Norma exposes herself as the coward she really is with ludicrous excuses for what she did and attempts to sacrifice her cronies to save herself (and she has the nerve to expect them to swear perpetual loyalty to her!). But the worst is yet to come. Norma lights a fag to calm herself, which starts a fire that spreads fast. 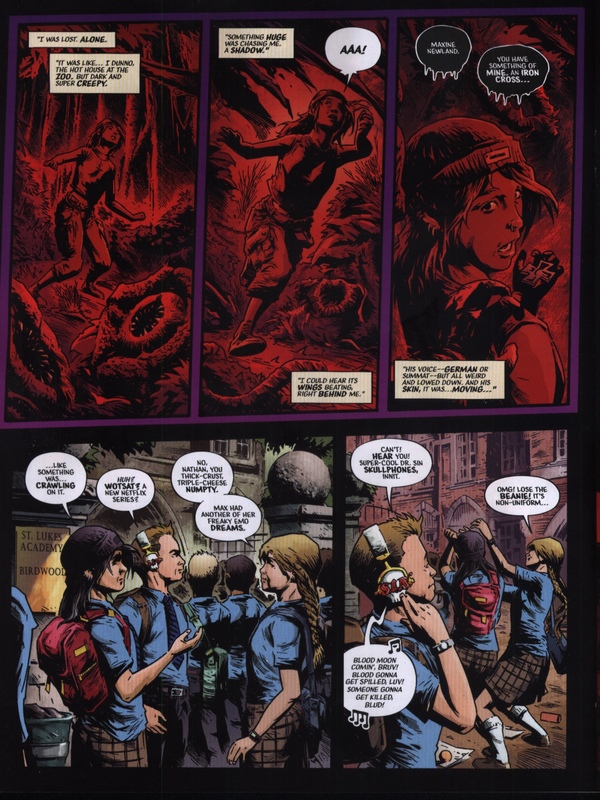 The girls begin to laugh hysterically as they become trapped in the fire, which fulfils what Rosemary saw in her dream. Rosemary tries to extinguish the fire telekinetically – but finds that she can’t! She has over-extended the power and now it has burned out, rendering her powerless. Then Grandmother appears, and extinguishes the fire with her own powers. However, the strain on her powers has been too much, and she dies in hospital. Grandmother dies content, as she feels she has made amends for that other tragedy, which blighted her life with guilt. Rosemary regrets not listening to her grandmother’s warnings, and also that she did not get the chance to spend longer with her. The police collect enough evidence on the nightmare party to send Norma to approved school. The fates of Dawn and Freda are not recorded, but no doubt these will include the reactions of Dawn’s parents to the state of the house and trouble with the police. Mrs Black disappears, leaving Rosemary on her own. Anne’s family gladly take her in. So Rosemary finally has the normal life she wanted, but is saddened at the price she has paid for it. This was one of the stories in Misty’s first lineup. Like Misty’s other first serials (“The Sentinels” and “The Cult of the Cat”), “Moonchild” still endures and is well remembered. There are strong indications that it was very popular, and writer Pat Mills attributes much of this to the artist, John Armstrong. 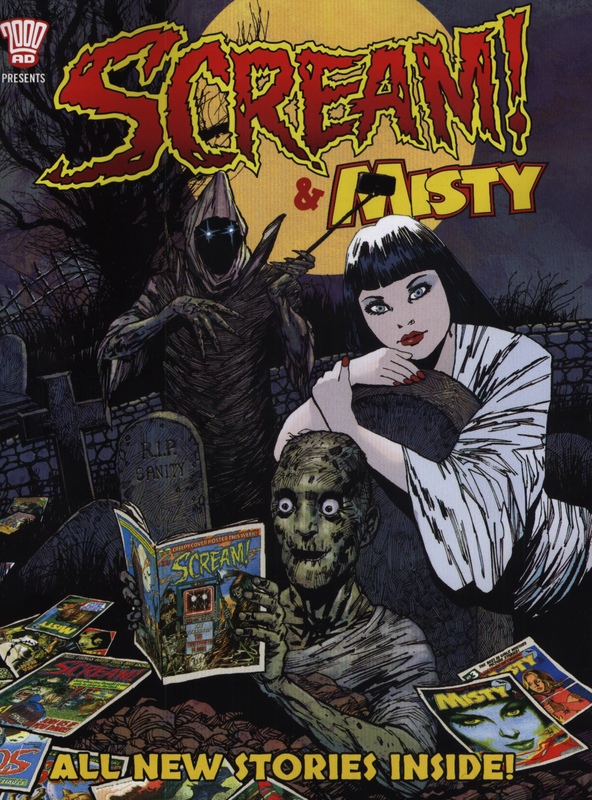 Many of Misty’s stories drew on popular literature and films. This one is definitely based on Stephen King’s Carrie. There is no mistaking the parallels. The protagonist is a bullied girl who possesses the power of telekinesis. The telekinetic is the product of a broken home, family tragedy, and an abusive, bigoted mother and absent father. The telekinetic uses her telekinesis to wreak a terrifying revenge on tormentors who tried to destroy her big night with cruel tricks. There are also some Rosemary’s Baby references thrown into the mix (the name of the protagonist and the Mia Farrow hairstyle she gets). And is Dr Armstrong named after the artist, John Armstrong? There have been zillions of stories about bullying, but the drawing card of this one is – what if the bullied girl has the power? Yes, wouldn’t we love to have a power like that to strike down a bully! We want to follow this story as soon as we read the blurb on the splash page because it is just something we would love to do ourselves. The exact origins of the power are not defined and the grandmother herself does not know where it came from. All she knows is, the power has been in the family for generations. The telekinesis is clearly hereditary, but it is not just some genetic mutation as in Carrie. It is linked to the moon mark and the moon itself, which the telekinesis draws its power from. This suggests some sort of supernatural or SF origin, and the undefined but clear connection with the powers of the moon makes the story even spookier. The insinuation of a supernatural origin also suggests that the power passing over Rosemary’s mother is not simply a genetic mutation skipping a generation. The grandmother tells her daughter she was probably not given it because she would have used it badly, and she could just well be right. Mrs Black is at least saner than her counterpart in Carrie, who may have a borderline personality disorder as well as being a religious fanatic who should feel right at home at Westboro Baptist Church. When we learn the reason for Mrs Black’s attitudes about the power Rosemary has, she even becomes more sympathetic and her conduct more understandable, although not excusable. It is easy to understand how the shock and grief of losing her father, her mother becoming his killer, her happy family life shattered forever, and spending the rest of her childhood in orphanages could affect her mind and cause her to become so twisted and irrational. Thereafter, she became terrified of the power, regarding it as an evil thing, and fearing that it could cause another terrible thing to happen in her life. Regarding the power as an evil thing that had to be crushed in Rosemary is not unlike the Dursleys’ attitude towards magic and why they treated Harry Potter so cruelly because of it. Mrs Black could also share the same roots as Tamsin’s grandmother in “Combing Her Golden Hair”. The grandmother outwardly treated Tamsin in harsh, unfair and even absurd ways. However, it turned out that the grandmother in fact meant well. She was just not going about things in the best way. Moreover, she did not realise that she was fighting a losing battle against a supernatural heritage. Unlike Tamsin’s grandmother though, Mrs Black loses that sympathy she ultimately gains when we learn that the real reason for her treatment of Rosemary is jealousy because she was denied the power. And after saying that the power is evil, we learn that Mrs Black would have used it for evil herself if she had been born with it (what a nerve!). Neither Rosemary nor her grandmother use the power that way. No, the power itself is not evil; it is the way that it is used. Those eccentricities Mrs Black has are more difficult to understand. Her attitude towards Rosemary’s power does not explain why she bans gas and electricity at her house and keeps the place in the dark ages with candlelight. Does she have some weird thing about modernity? Or is it to save money by not having to pay power bills? And why does she wear that weird, sinister cloak when she goes out instead of a simple coat, which makes her such a magnet for gossip that she’s a witch or weirdo? And if Mrs Black hates her mother so much because of the telekinetic accident that killed her father, why does she keep a photo of her around the house? And why does she just disappear at the end of the story? It certainly is a very quick way to get rid of her (and good riddance! ), which would open up a new life for Rosemary where she can live happily and normally. And given the way things were going between her and Rosemary it is probably not too surprising. But it is not really explained at all. Doesn’t she even leave a note? We have to wonder just how much Mrs Black really loved Rosemary in the first place – if she ever loved Rosemary at all. The evil in the story does not come from the power but from people’s cruelty. This comes in the forms of the abusive mother, and the bullies at school, though we see some other abusive people around, such as a kid who taunts Rosemary and calls her a witch. Norma is always saying to her cronies that Rosemary deserves to be hurt because she’s so weird, but that’s just her excuse of course. She just does it because she is a bully, a bad sort, and looks like she is on her way to delinquency. She comes from a line of John Armstrong bad girls with short black hair, leather jacket and knee high boots. June Roberts, who was the bane of Bella Barlow in her 1979 story, is perhaps the best example. Unlike Norma, June changes her ways in the end. Norma has no compunction about anything she does and will go to any lengths to get her own way. When Dawn and Freda sometimes get qualms about Operation Rosemary, Norma pushes them to continue with it. Norma is also extremely clever and a smooth talker who bluffs or talks her way out of fixes, though she does not always succeed. Her cronies say she would be top of the class if she tried, but the only thing that interests Norma about school is bullying Rosemary. Norma’s tag line to get out trouble is to bluff people with the threat that she will set her father on them as he is the [whatever]. She even tries it on the police when they say they will send her to approved school! As there is only one instance where this bluff actually succeeds, we get the impression it’s more cheek than anything else. From the brief glimpse we see of Norma’s home life, her misconduct is clearly rooted in her parenting. Although Mrs Sykes suspects the truth about the horrible thing (the ‘birthday cake’) that Norma is making, she does not investigate further because she is heading off to bingo. She wonders if she should send Norma to the doctor to get her head examined, but Norma’s line “Don’t nick any of me fags on your way out” indicate what sort of example Mrs Sykes sets to her daughter. At times, Norma can be witty and delivers very funny lines, mostly when she is being impudent or planning something. One of the best examples is where she styles herself as fairy godmother to bring Rosemary her birthday party: “Norma Sykes, fairy godmother – dreams come true a specialty. Magic wand no extra charge.” It must be said Norma delivers the only comic relief we see in this unsettling, grim story, even if she is also the main villain. And now we come to Rosemary herself. All she wants is to lead a normal life where she is loved, accepted, and have lots of friends. But in order to get there, she has to unravel the mystery of why her mother keeps denying them to her, what this thing is that her mother has about ‘wickedness’, and just what the ‘weirdness’ is that nobody can really explain but makes her a magnet for bullying. It is not surprising that they are connected. It all comes from Rosemary’s telekinetic heritage and how it turned Mrs Black into a monster – and eccentric – from grief, hatred and jealousy. It is ironic that the very thing that lay at the root of all Rosemary’s troubles was the only way out of all the abuse and bullying she suffers because of it. Rosemary does not kill anyone as Carrie does before she herself finally dies in the story. However, this story does not shy away from its own tragedy and deaths. We cry for the grandmother when she finds she unwittingly killed her own husband with her telekinesis. We cry even more so when we see that Julia does not understand that her mother didn’t mean to do it or how bad she feels about it. The grandmother too probably began to hate her own power after that, whereas it is not so much the power but panic that was the problem. A normal person could well do the same thing with a gun or poker if they were in the same situation. It is a relief to see Grandmother finally find peace over the tragedy on her deathbed. Rosemary’s friend Anne is a real brick in that she not only stands by Rosemary all the way but also does not condemn her power as evil or witchcraft. Rosemary’s power does not frighten her either. Instead, she is one of the people with a more level-headed attitude about it and compares it to Uri Geller, which in her mind must give it scientific validity. She helps Rosemary to explore, develop and understand the power. Anne also tries to encourage Rosemary to stand up for herself more, which is something Rosemary begins to do as the power gives her more confidence. Anne has the sense to rightly suspect Dawn’s supposed friendliness is not all it seems, but eventually she gets duped by a bunch of get-well flowers and how much they must have cost. Didn’t it occur to them that the flowers might not have been bought at all? Dr Armstrong would also be a real friend to Rosemary if he had a better attitude. He assures Rosemary that her power is not evil as her mother says; it is scientific and he gives her the scientific name for it. Dr Armstrong also tries to reason with the mother and get her to accept that the power is not evil. The trouble is, he starts getting too greedy and ambitious over Rosemary’s power. He wants to make his name with it and has no respect for Rosemary’s feelings over it. The nurse is far more sympathetic and tries to plead with the doctor that she has the right to lead a normal life. Losing the power in the end is not unusual in girls’ comics. But in this case it really is the only way for Rosemary to start leading a normal life, though not before she is finally rid of all that domestic and school abuse of course. Still, we can’t help but hope that the power of the moon will restore Rosemary’s powers. Maybe they will consider it for a new Moonchild story in the new Misty material that is beginning to come out?